Women are often more impacted than men by violent conflicts, but they are also able to respond to those conflicts, especially as peace facilitators, making post-conflict situations a fertile ground for women leadership. For example, “Colombia is coming out of an important negotiation with the largest illegal armed group [the FARC]. It’s definitely a turning page in the country, and the actual peace deal is very much recognizing women as leaders of the reconstruction. It also recognizes that the majority of the victims have been women and children,” said Gabriela Bucher, executive director of Plan International Colombia. “I was in Croatia in the ‘90s and in Kosovo in the 2000s. I watched women going from being the face of sexual violence in conflicts to the new civil society, to the new economic drivers for their families, to the communicators between international community and their own population, and the glue that held it together because of their ability to adapt,” said Lerner. There is a virtuous cycle of peace, economic growth, and empowerment: Women and girls help create the conditions for sustainable peace and stability, which is “a precondition for sustainable economic growth. You can’t be talking about economic opportunities and growth if you don’t have the fundamentals,” said Tessie San Martin, President and CEO of Plan International USA. “There is a link between economic empowerment and social empowerment. You can gain respect, you can make decisions about your life, you can provide a better health and education to your child if you are economically empowered,” said Dr. Banda. For more on women’s contributions to peace and stability, see our April 29, 2016 event on the growing role of women in sustainable development and peace building. You can hear more from H.E. Joyce Banda in her conversation with Gwen Young of the Women in Public Service Project on the importance of advancing women leaders in Africa. Amelie Petitdemange is an intern with the Women in Public Service Project. 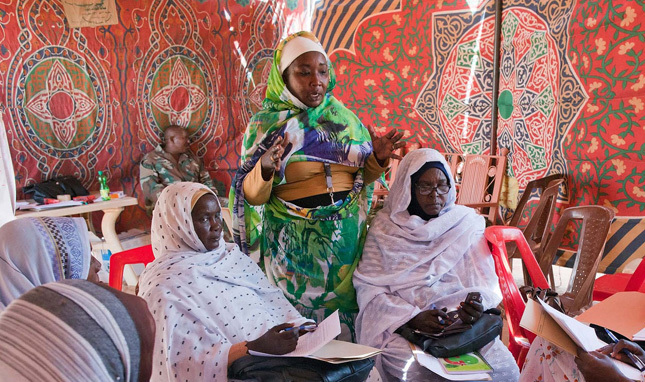 Photo Credit: Women attend the Open Day Workshop on the UN Security Council Resolution 1325 on Women, Peace and Security in Malha, North Darfur, organized by UNAMID Gender Unit, courtesy of Sojoud Elgarrai, UNAMID,.